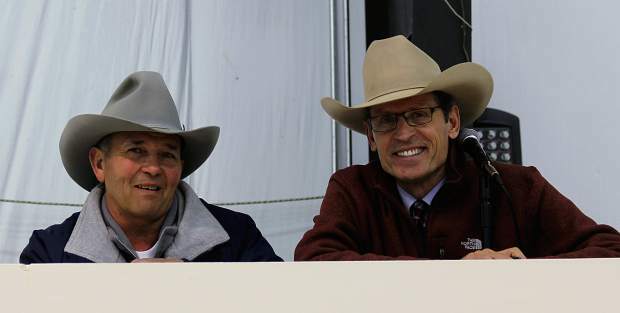 Sale host Mike Richert with auctioneer, Roger Jacobs at the 35th Annual Open Gate Ranch bull sale. 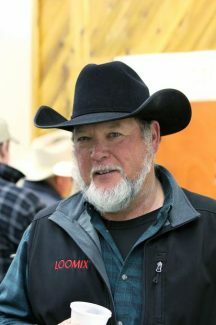 Mark Hitchcock, Dupier, Montana purchased Open Gate Ranch bulls. 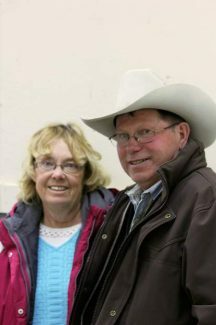 Jim and Nancy VandenBos, Valier, Montana purchased Open Gate Ranch bulls. There was a slight drizzle and wet snow falling for the Open Gate Ranch Simmental sale held at the Broken O Ranch near Simms, MT on Mar. 17, 2015. It was kind of nice to look at bulls with some moisture in the air and mud on your boots. This was my first trip to this sale and I must say I was impressed with the quality, depth and thickness of this set of bulls. 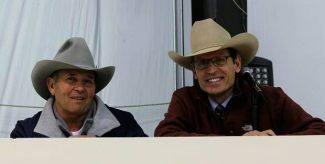 The bulls combined heavy weaning and yearling weights with calving ease and eye appeal. This is a set of bulls that will add pounds at weaning time and leave you with fantastic replacement females. Topping the sale was lot 44, BX 399, a Feb. 28, 2015 homozygous black, homozygous polled purebred son of Triple C Singletary S3H with epds of BW 4 WW 76.7 YW 121.6 Milk 24.6. The bull had a weaning wt. of 850 lb. and scanned a 15.7 ribeye. Three Pine Ranch, Great Falls, MT was the buyer at $13,000. Selling at $9500 was lot 41, BW 820, another Feb. 2015 son of Triple C Singletary S3H with epds of BW 3.1 WW 76.9 YW 116.9 Milk 24.2. Jeff Beck, Farfield, MT was the buyer. Lot 59, BY 600, a Feb. 2014, halfblood Simmental bull sired by WHS Limelight 64V with epds of BW 1 WW 76.2 YW 124.6 Milk 19.8 sold to Fairhaven Colony, Ulm, MT for $9,000. Also selling at $9,000 was lot 64, BS 598, another halfblood Simmental bull born Mar. 2014 sired by Sitz Madison 10477 with an 870 lb. weaning wt. and epds of BW 1.7 WW 78.9 YW 125.4 Milk 17.3. 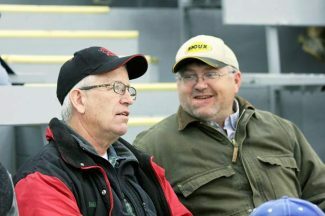 Mark Hitchcock, Dupier, MT was the buyer. Lot 69, AT 717, a black, polled ¾ Simmental bull with epds of BW 0.5 WW63.4 YW 97.5 Milk 21.7. This bull is a Sept. 2013 son of SVRW 909 that sold to Lazy 3L Ranch, Miles City, MT for $8,750.